Summertime. In the Pacific Northwest, July means summer begins. Let’s talk family. We come outside like ants to sugar seeking sun. Outdoor activities are crammed into what seems like a 30 day period so we can sustain the rest of the year in the rain. As we move into July we are on our 13 month of being in a “temporary apartment”. The best part, it is now the season we can actually use the pool. I love that part. When we moved into this apartment over a year ago, we intended it to be a short season. We do not mind being in an apartment it has actually taken our lifestyle down to a very minimalist living. Gone are the days of Costco bulk shopping. We are here in all our craziness. The issue has become that I did not plan for apartment size furniture in my choices of items we moved here versus what furniture we put in storage. We feel a bit closterphobic. For the past year, there is no escaping family. Everywhere you turn in the apartment, there someone will be sitting, playing, eating, working. We are everywhere. It has been an intense journey creating close family living. It was an unintended consequence to selling our house fast and wanting to take time to find the next place. We do not want to settle. So here we are. Our big, bulk-costco-shoe-fanatic-teenager-living kinda life behind us. Have you ever had an unintended consequence to a decision that turned out better than you can imagine ? Do not get me wrong – in those close intense moments it can be difficult not to be able to retreat. But then again when you have no place to hide, you learn much more about each other. You learn to live together, not simply co-exist. If life is a marathon, then we are on the off-road, lost our map, and have fallen on our face several times portion of the race. We have not always embraced this crazy season. We remind each other not to whine. It is not life-threatening, we are all healthy, we have a pool we do not have to take care of ourselves. Sometimes we need perspective. It is summer. Let’s talk family. 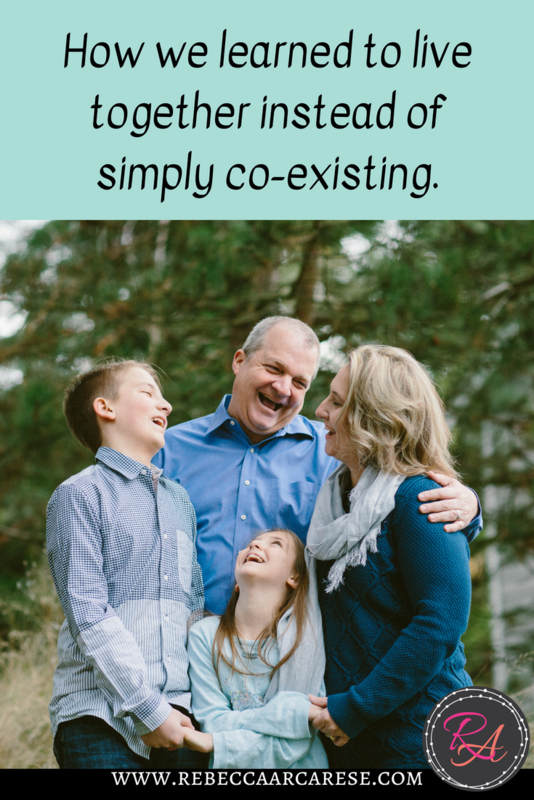 Let’s look at ways to embrace the crazy of family – both blood and inherited. How can we find our rhythm in whatever marathon stretch you are in with your own family? How can we find a perspective that helps find the good in what seems challenging? Can you find the sun behind the clouds? Share with us this month on family. Your favorite spots to vacation, your very real photos, your lemons that are not quite lemonade scenarios. I’m happy to hear your stories! Even though you have a lot of things to do with the apartment movement it’s so nice to hear your family is united and happy! I think living in an apartment is a great way to downsize, minimalize, and save money. Summer is a unique time of year for us – I’m off from work and the kids adopt a much different schedule than their usual school year schedule. We are always adapting to changes! What an awesome, honest blog post; thanks for sharing your heart! I’ve certainly experienced times in which it’s hard to see the sun for the clouds. But I’ve also found that working on being happy where I am, in the moment, helps me find the little things in life that I can enjoy. “Bloom where you’re planted”, after all! Embrace your crazy. Because it’s awesome. You’re making priceless memories. This is such an important thing to do. We have to learn to live and make memories. Life is really too short! I love this post, Rebecca. Thank you for reminding me to press in when I want to retreat. This is such a sweet post! I agree that we should really live together, instead of just co-exist. You said it perfectly! What a great read about family. I’m originally from the PNW, too. Crazy frustrating how late Summer starts. haha. What a honest post, thank you for sharing. I know all too well about closeness in apartment. Living with my husband and dog in 500 sq foot. No kids yet for this very reason. Thank you for sharing your stories. I hope your living situation will be resolved soon.